Hey everyone! I had a lot of people ask me about the cake stands I made for my son’s second birthday, so I thought I’d try my hand at a tutorial for you. These are so easy that I started them in my car on our drive to Thanksgiving which is why the photography leaves a lot to be desired (sorry about that). I’m pretty lucky that my car has a regular electrical outlet so I can plug in my glue gun! We have done a little birthday cake/singing thing over Thanksgiving weekend at my husband’s family’s farm in Georgia because it’s close to his birthday and he’s been too young to enjoy a real birthday party. Plus, this allows us to take advantage of having our family already together in one place. It’s a great plan, but everything I do has to come with me on the 8+ hour drive to the farm because there is not much going on in that small town, so I don’t have a place to run out and get something if I need it. There’s not even a bakery for me to get a cake! So I end up doing a mini-birthday on the go. I try for everything to be simple, not fragile (so it can withstand the drive), but still fun and exciting for my son. I think these fit the bill. That’s it! Told you it was easy, right? And cheap! I spent $9 on the foam and $1 on the tissue (a mega pack from the dollar store that I already had and I still have a bunch of pink left). This would also be great to add different heights to a buffet or entry table display…I can see it with a solid color or metallics…the possibilities are endless! And a little bonus tip: I used cheap plastic table covers to cover the cake boards. They are pretty thin, so I doubled it up. This is great because it makes the cake board prettier, and it doesn’t soak up oils from the frosting and get messy like covering with paper would do. 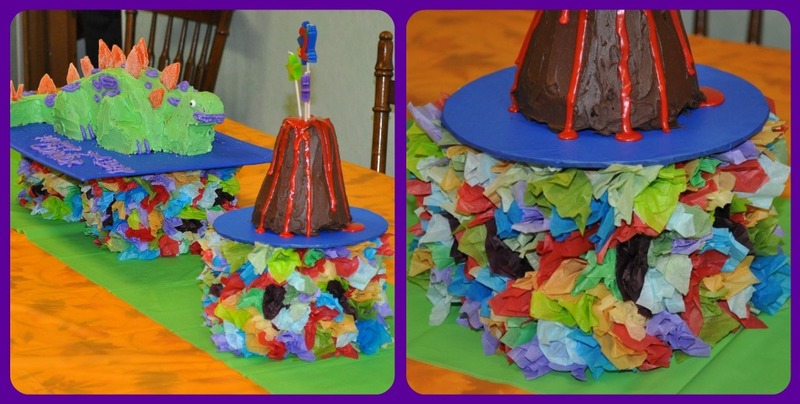 This entry was posted in birthdays, celebrations, crafts, creativity, diy on December 15, 2011 by aliciamariel. Thank you! That means a lot! I am so glad you enjoy it!